The Oakland artist’s latest track is an ode to cosmic attraction. 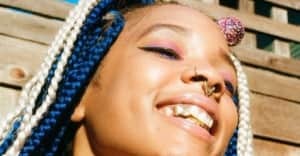 Oakland singer, rapper, and songwriter Siri has been garnering deserved attention for her whimsical, etherial stylings, showcased on her excellent 2016 EP, GAWDBAWDY. Her new video for "All of You," which premieres on The FADER today, is a meditation on the otherworldly experience of falling for someone. The Xiomara Blanco-directed visual features layered, psychedelic effects transposed over Siri's image. "The goal of this video was to create almost an interactive, psychedelic trip," Siri told The FADER over email. "The visuals used for the track definitely illustrate what it feels like visually, for me at least, to fall for someone. It's a trip. When someone is willing to give you all of themselves, they are letting you see them in their purest forms." Watch Siri's "All of You" video above.